With recent increase of cars, the noise problem has been caused by exhaust sounds generated from exhaust pipes, which consist of weak pressure waves called blast waves. To diminish the noise, a silencer is installed in front of the exhaust pipe. In the present study, reflectors were installed in the high-pressure portion of the shock tube to generate blast waves, and as silencer models, three basic types of expansion regions were combined with four types of porous panels and acoustic material of glass wool. 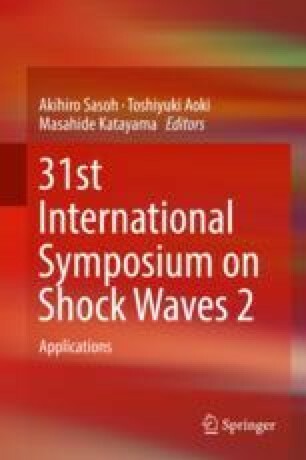 The pressure decay was investigated by transmission and reflection factors to the incident blast wave, together with pressure histories and high-speed movies by the shadowgraph method. As results, it was confirmed that the porous panel contributed to weaken the blast wave to some extent, while the acoustic material does greatly: the one-stage expansion model with a porous panel and glass wool recorded the highest decay of the peak over pressure for transmission and the two-stage expansion model with those showed the second highest. The acoustic material also contributed to decay of reflected shock waves propagating toward an upstream duct.